Hafiz Saeed, leader of Jamaat-ud-Dawa, which is alleged to be an alias of Lashkar-e-Taiba. 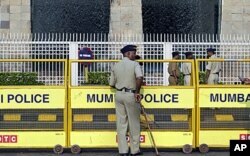 Pakistan has banned media coverage of Jamaat-ud-Dawa (JuD), an Islamist charity accused of planning the three-day terror siege of the Indian financial capital of Mumbai in 2008 and declared a terrorist organization by the United Nations. The Pakistan Electronic Media Regulatory Authority (PEMRA) issued a notification late Monday, barring all domestic television and FM radio stations from coverage of 60 organizations the government has banned, along with 12 others added to a U.N. Security Council’s list of entities known to support al-Qaida and other terrorist networks. The announcement particularly mentioned JuD and its affiliates, the Falah-i-Insaniat Foundation (FIF) as well as the banned Lashkar-e-Taiba (Let), “strictly” directing the media to not give any kind of coverage to these organizations in breach of obligations under United Nations resolutions. “Moreover, any advertisements for fund collections by proscribed organizations in electronic media shall also constitute a breach of these obligations,” the statement warned. The decision is taken under National Action Plan (NAP) to crack down on proscribed organizations and terrorists financing, it added. The U.N. lists Jamaat-ud-Dawa as an alias of the Lashkar-e-Taiba that India and the United States blame for planning the Mumbai attacks in which at least 166 people were killed. The U.N. also individually lists JuD chief, Hafiz Saeed, as a leader of the LeT terrorist organization. The United States has put a $10 million bounty on Saeed's head. Indian authorities have long blamed LeT fighters for fueling a Muslim insurgency in the disputed Kashmir region. Hours before the official notification banning media coverage, Saeed held a press conference in Islamabad where he gave details of the rescue and relief work Jud is undertaking in northern and northwestern parts of Pakistan hit by last week’s powerful earthquake. “Thousands of our workers are engaged in the relief work and up to 25 teams of our doctors are treating victims in make-shift hospitals in quake-hit areas like Chitral, Dir and Bajaur,” Saeed told reporters after dispatching a convoy of trucks loaded with relief goods and medical supplies with banners of the group FIF. A Pakistani boy examines an earthquake-damaged house in Mingora, the main town of Swat valley, Oct. 27, 2015. 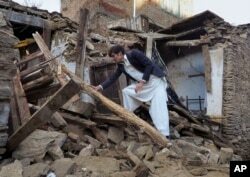 A day after the earthquake struck, the Pakistani government had announced that no "banned/proscribed organization will be allowed to undertake rescue and relief activities" in the disaster zone. But Saeed asserted that Pakistanis are fully cooperating with his charity group in terms of giving donations worth billions of rupees and the money is being spent to meet requirements of the needy people in under-developed parts of Pakistan. India has long demanded Pakistan arrest Saeed and stop him from undertaking public activities. Authorities in Islamabad, however, insist there is no evidence linking the cleric to the Mumbai carnage, though several LeT members are under trial in Pakistan for their alleged role in the terrorist raid. Pakistan's Prime Minister Nawaz Sharif (l) and President Barack Obama at the White House, Oct 22, 2015 (VOA photo - Aru Pande). Monday’s announcement came more than a week after Prime Minister Nawaz Sharif’s official visit to the United States where among other issues countering terrorism and extremism came up in his talks with President Barack Obama. 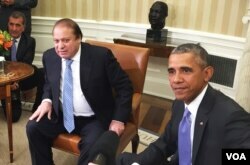 “In this context, the Prime Minister apprised the President about Pakistan’s resolve to take effective action against United Nations-designated terrorist individuals and entities, including Lashkar-e-Tayyiba and its affiliates, as per its international commitments and obligations,” said a joint statement after the Obama-Sharif meeting.